Venue: Rod Laver Arena, Melbourne Park. Coverage: 08:15 GMT - BBC One; 06:00 - BBC Radio 5 live and 07:30 BBC Sport website for TV, radio and live text commentary. Andy Murray's form is good enough for him to start as favourite in Sunday's Australian Open final against Novak Djokovic, says Martina Navratilova. Murray has lost two finals against Djokovic in Melbourne, but beat the Serb to win the 2012 US Open title and Wimbledon in 2013. Top seed Djokovic admitted he had not played well in Friday's five-set semi-final win over Stan Wawrinka. 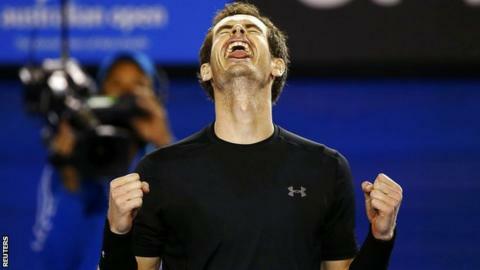 "Andy might be a slight favourite for me," Navratilova told BBC Sport. "I think Andy has slimmed down a little bit; he seems to be a bit leaner, he's moving really well, still has all the power, improved his second serve," the 18-time Grand Slam champion added. "He has got to be encouraged by his performances so far in this tournament, and also by the fact that Djokovic wasn't at his best against Wawrinka. "He's got to like his chances. He's got a losing record against Novak but he has beaten him before." Murray has dropped two sets in six matches at this year's Australian Open, beating 10th seed Grigor Dimitrov, Australian teenager Nick Kyrgios and seventh seed Tomas Berdych in the last three rounds. Mats Wilander, a three-time champion in Australia, believes Murray's game looks more "harmonious" than ever. "I've enjoyed watching him much more during this Australian Open than ever before," the Swede told BBC Sport. "I think now he's having fun. He wants to fight. He's a competitor and hopefully the end result is you're going to win as well. It just looks more harmonious." Coach Amelie Mauresmo has been the focus of much attention as she looks to guide Murray to a third Grand Slam title, and their first since beginning to work together last June. Murray has been keen to praise the Frenchwoman, describing her as "brave" for taking on the job following the departure of Ivan Lendl three months earlier. "It's great to see him back playing at the level we all know he's capable of," said Lindsay Davenport, a former world number one, now coaching American Madison Keys. "I'm just happy to see him out there with that fiery, competitive spirit. That is what allows him to play his best, when he's healthy. "I thought on Thursday night everyone was touched by how he played and when he won, the celebration towards Amelie and how he said he was playing in defence of her." Marion Bartoli brought Mauresmo into her team during her surprise run to Wimbledon victory two years ago, and says her compatriot needed time to have an influence on the Briton. "I'm really happy for Amelie," said Bartoli. "She has been able to overcome all the criticism. "I think the press was really hard on her, and for nothing, because in sport nothing comes right away. It's not like she's going to just arrive in the team and Andy's going to win everything. It doesn't happen this way. "I'm really happy that she's proving a woman can coach a man, even though I'm sure she's not thinking this way."